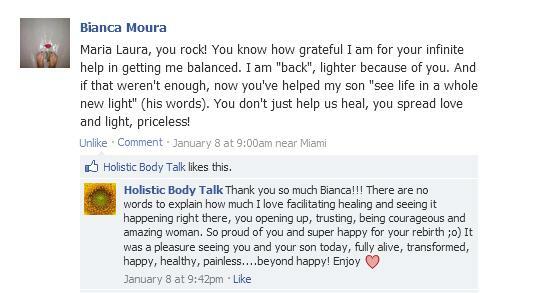 The core intention of Holistic Body Talk is to provide consciousness and awareness on the holistic aspect of healing and offer tools so families and individuals can respond to the body's signs of imbalance from a different point of reference. In this way, old patterns and symptoms dissolve or disappear and health is restored at all levels. BodyTalk System is a non invasive, safe and highly effective healthcare system that supports and allows the body to resynchronize and find balance. BodyTalk is offered in private sessions or distance healing sessions. We are born with an innate wisdom that allows our body to synchronize its activities and heal itself. Unfortunately stresses of our daily lives causes us to burden our systems and ultimately impairing its functions. The build up of those stresses are reflected in our bodies in the form of disorders, diseases or just imbalances. It will depend on the length we have been allowing that imbalance to grow whether it will reflect in migraines or a more serious disease. On the other hand, how it manifests will depend on our weaknesses. Some will have digestive issues, some will have emotional imbalances with dizziness, lack of breath, confusion; while some others will develop chronic fatigue or other disorders. BodyTalk addresses acute pain, chronic disorders, emotional distresses including family dynamics and environmental factors among others. Holistic Body Talk's focus is to facilitate healing and educate families to learn new ways to cope with daily stresses while enhancing and revitalizing their lives. I am honored to be part of your health and wellness aspect in your life. I look forward to serving you!